Everyone loves a party, Bogart and me included. With Blue Bird almost ready for “prime time,” with it’s freshly painted exterior, I accepted an invitation from Stacey Healy-Dooney to attend this wonderful get together. 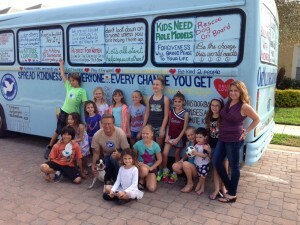 Nearly a couple dozen children and their parents came by to share in learning of One Million Acts of Kindness. Bogart was in his glory, playing with all of the children and even taking time to help put his paw prints on the “Rescue Dog on Board” window. Thank you to everyone for making this day a great success. This entry was posted on Monday, February 24th, 2014 at 9:49 am	and is filed under Kindness. You can follow any responses to this entry through the RSS 2.0 feed. You can leave a response, or trackback from your own site.